Kloshe Wapsini lived in western Pennsylvania with her family, Bob and Bronwell, otherwise known as Dad and Mom. She was adopted from the Dandies in Distress Program in July of 1992 at the age of 15 months. The first days after her adoption, it was obvious she was pining for her foster home and her old friends and family. Leaving Steve and Jacolyn, their Dandies, Pauper and Carey, and other rescues in varying stages of rehabilitation was a wrenching experience. She had lived with them since her rescue from a Missouri puppy mill in December of 1991. Thereupon, she began to write her dear friends, Carey and Pauper. Through her letters she could explain her feelings, new surroundings, and experiences of self-discovery. As her new life unfolded she found many amazing things to share with her old buddies. Memory of her early life in the puppy mill began to fade, as well as those of endless moves. Life became more stable and new joys emerged. It becomes obvious she relishes having her own home and loved ones. Carey and Pauper were so impressed with her writing they asked her to answer a request from a gentleman in Scotland for a description of how the Dandies in Distress program works in the United States, and how it affects individual dogs. Kloshe Wapsini inspired these letters and would not be denied the opportunity to write her friends and share her adventures and observations. She dictated every event and reaction. Living with her was a privilege and a reminder of the basics of living together as creatures on this planet. Many Dandie lovers have encouraged the publishing of these letters. As Kloshe was a victim of glaucoma and had become widely known through the promotions of her cause by the Dandie Dinmont Trust, it seemed appropriate her letters should be published. 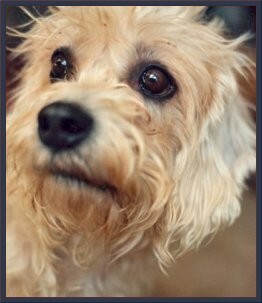 The Dandie Dinmont Trust was formed in 2001 via the internet with the purpose of raising funds to support the health and well being of the Dandie Dinmont Terrier. The founders of the Trust, Celia Danks of Scotland, Ineke ter Heersche of The Netherlands, Margreth Wall of Sweden, sought out Bronwell Bond and Kloshe of the United States to promote the glaucoma issue. Connection to the international Dandie community was begun through newsletters, emails and word of mouth. The web of support and interest has continued to grow in strength and commitment. This book is promoted in support to the work of so many on behalf of the health of the Dandie Dinmont Terriers in anticipation of a brighter future for this beloved breed.